white.fish.tank opens its 2011 programme with Modus Operandi, a solo exhibition by Italian artist Patrizio Di Massimo (Jesi, 1983). For the past several years Di Massimo’s research has focused on the meaning of national identity and the relationship between rhetoric and historiography. Despite being rooted in recent Italian history, his research is concerned with apparently long-forgotten political and social issues. His critical and incisive investigations draw on the mythical ruins of a national past on which Di Massimo reflects through a series of witty juxtapositions and stratifications of meaning that recontextualise the subject matter with a sharp and contemporary perspective. In the quest for inherent manifestations of a national identity divided between commercial TV programmes and classical portraiture, rhetoric refutes its very definition, exposing a present which seems to lack either history or ideology. Through a complex process of signification, Di Massimo’s new body of work carefully weaves a web of connections between society, art and politics from the 1920s to the present day. Encompassing video installation and painting, Modus Operandi investigates concepts of disguise, costume and representational ambiguity and reflects on the development of television as a tool of social symbolism and political promotion. The exhibition opens with Ritratto di Alfredo Casella, 1924, a copy of De Chirico’s 1924 painting. This work was also the subject of a recent performance called Fuga Dal Disordine which Di Massimo developed for Villa Necchi Campiglio in Milan, and is of particular significance in his artistic oeuvre since it embodies his engagement with 20th-century neoclassicism and the Italian “return to order” movement. Typical of royal portraiture, the painting’s iconography reiterates a compelling relation to concepts of power and representation which are once more restated by the video installation featuring Emanuele Filiberto of the House of Savoy. Since the edict of expulsion was cancelled in 2002, the grandson of Umberto II, last reigning King of Italy, has taken part in several television programmes to reconnect himself with the Italian population. Recently he competed in the series Ballando con le stelle (Strictly Come Dancing), dressed in various ballroom costumes. 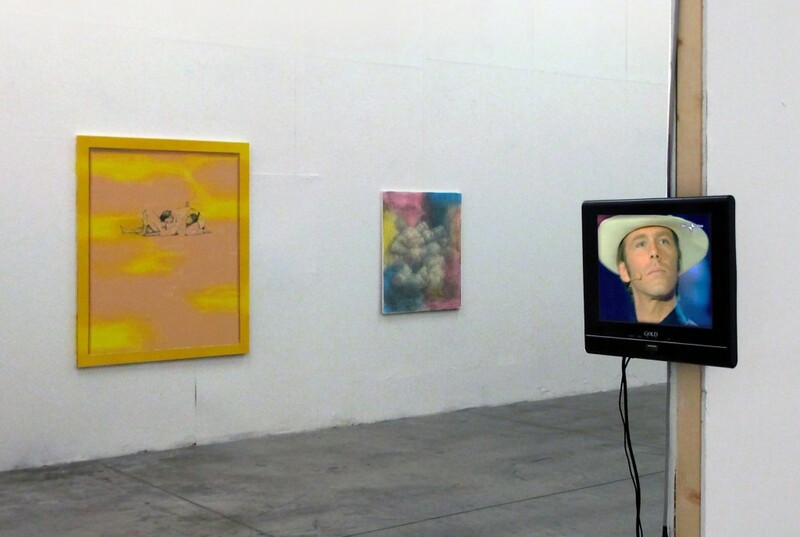 Five of these episodes are featured in the exhibition’s video installation. Di Massimo’s new sequence can be considered his first experimentations in the medium of painting. Keepers – but at the same time concealers – of the codes of classical art, the canvases are linked to the idea of representation as a system of elements concerned with acting, stage and costume and reinforce the concepts of camouflage and mise en scène.